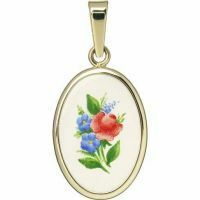 Our flower medallion is individually hand-painted and fired in a kiln to the temperature of 750°C (1300°F). A solid gold 585/1000 frame is hand-engraved. Each and every flower medallion is individually painted and fired in a kiln to the temperature of 750°C (1300°F). 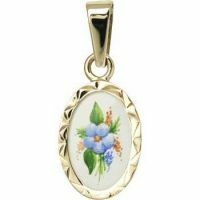 A solid gold 585/1000 frame is hand-made and hand-engraved, without using any machine, highlighting the distinctiveness of this delightful item. You can be guaranteed of a truly unique work of art. A rear side doesn't bear an inscription. 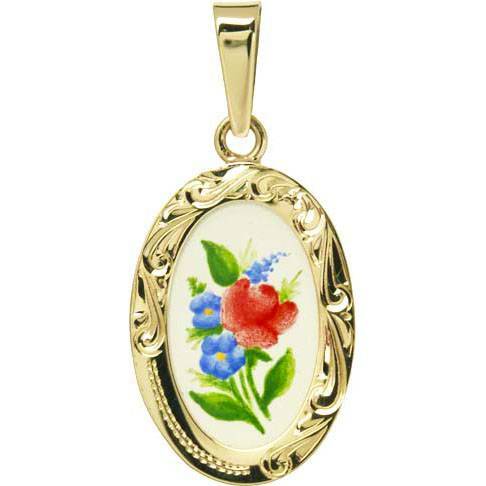 There is a glossy white surface of fired jewellery enamel.